Here is the info on Ted wade's Memorial Service. Please feel free to share this one with anyone else, thank you. Please feel free to share personal stories about Ted. He was a great fisherman and a friend to many, here. WOW, Ted was a great guy I had not heard he passed. Unbelievable. I also hadn't heard about this. I am glad to have known Ted Wade. He was a fine fisherman with a great personality. What a bummer. I guess I'm just grateful to have spent a little bit of time with him on the water. RIP Ted. It breaks my heart to hear this. Ted was one of the good guy's. Spent a lot of time on the river fishing next to him over the years laughing and telling stories. I hadnt seen him in several years, but on a float down the Wilson last spring.....there he was. Spent an hour catching up while my fishing partner kept wispering.....I want to fish, i want to fish! Glad I ingnored my fishing partner that day. RIP Ted. You were one of the best! I agree with those above who put Ted in the "good guy" category....he was also in the all star "character" category. We all know about the banana theory....Ted rowed a bright yellow "banana" drift boat and made fun of those who used a banana as an excuse. He'd say "some of us can catch them, some need an excuse." I was on the oars in the Yellow Clack near Vic's hole on the Wilson , the day Ted caught His last 20lb steelhead. Bill Miller came around the corner while Ted was fighting the fish(22lbs) and took a picture of Ted with it. He is bringing a copy to the service, so I can have it blown up and put on the wall at Alice's next to our other departed friend Bernie Thiebert. RIP big guy, you were one of the best!!!! I am Ted Wade's Daughter, Raina. I love these pictures of my dad. Thanks for the kind words about him. I miss him so much. I know there are many fishermen out there that feel his absence. 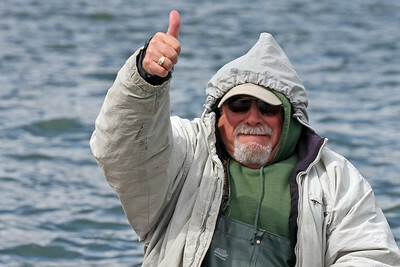 I fished with Ted years ago, back in the 80's out on one of the tillamook bay rivers. He was a hoot. We didn't get any that day, but it wasn't for lack of trying. He was indeed a character. Remember the face but did not know the name. R.I.P. my friend.Better yet enjoy the best that is just ahead. You were a memory at Tillamook bay. Your dad was quite a guy and I always enjoyed joking with him. 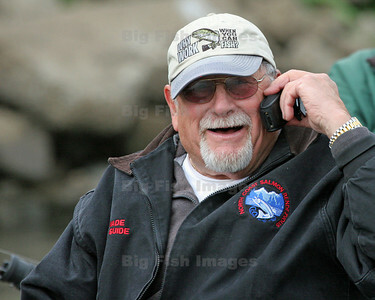 He had a contagious smile and a very positive fishing attitude. I know he went through a rough time after your mom passed, but he still managed a smile and thumbs-up. If you're interested, both of those pictures can be downloaded from my photosite: www.bigfishimages.com Look in the "Special Events" section and you'll find one in the 2007 OWHF Salmon Quest gallery and the other is in the 2008 Salmon Quest gallery. I have the original files and don't hesitate to get in touch if you'd like copies or large prints - no charge. Thanks so much for the link. I will check it out. I am sure i will want a copy of the pics. They really captured his essence. Yes, he struggled a lot after Judy died. She was his soul mate. She was my step-mom. They were made for each other. I am sure they are back together, fishing in heaven. Yes, my father was a character! Fishing was his life and I know that is what kept him smiling. It is so wonderful to read everyones memories of him. I know there are many. I am in the process of selling his gear and boats. I can't post an ad on this site as I don't have the status yet. Must have had to post 50 times. I am wondering if you know where i could post to reach my dad's buddies. I know he would be pleased to know that his gear went to guys he knew, and fished with. I am selling his 19ft Alumaweld sled, and his 15 ft Clackacraft drift boat in addition to poles, reels, lures, etc. As you can imagine, he had a lot of gear. Thanks again for the great photos and the link! So very sorry to hear about you Dad. He was a great guy, good fisherman and just plain fun to be around. He taught me a thing or two over the years. He will be missed by many. He never really recovered from loosing Judy and I know their are happy & together now. I might suggest you PM Jen for special permission to post in the classifieds or feel free to PM me and I will help you post anything I can. I know lots of people would be proud to own and fish with one of Teds rods, me included.